A rewarding and very successful fundraiser that our school community undertook, was to publish students' individual written stories. Every child at our school wrote a one page story and their story was published in professionally printed compilation storybooks. The books were sold to our school community and we offset our printing costs by allowing local businesses to sponsor our books. 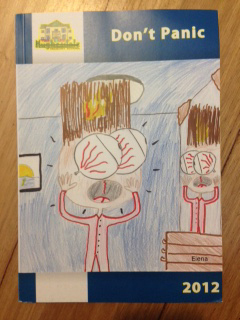 Each grade level created their own book and every child created their own personal cover. All the profits went back to our school and being able to do it online made it so easy. Not only did we raise much needed funds, but we had a whole school of proud published authors! Lots of schools use variations on publishing books to raise funds, inspire their pupils and make Mum and Dad proud! These can be about anything from recipes (school cookbooks are always popular) to poetry to stories. The beauty of online publishing is that everything becomes very easy and the books can be tailored in all sorts of different ways. Suzanne's school used an online publisher based in Australia called Schoolyard Stories who specialize in school fundraising. An internet search would soon turn up similar in most locations. As Suzanne says imagine a whole school of published authors - and even better if you raise some funds in the process - what a great result. Thanks for sharing.